Tema en 'Jubaea chilensis (palmera chilena)' comenzado por Christian1, 19/2/11. I write here in hope of finding someone who can help me to buy a Jubaea Chilensis tree. I live in Sweden so i guess it will cost a bit by sending it here. I have several palms in my garden. All of wich i protect during winter. 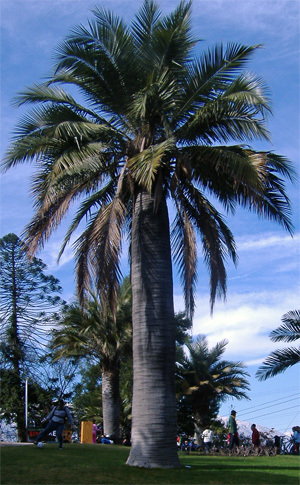 Some palms like Trachycarpus Fortunei dont need much protection. In stores i can buy small Jubaeas but i want to buy a big tree. Can someone help me please. I really hope you have lucky !!! Even here in Chile , the Jubaea Chilensis are so spensive!!! i really like " la palma Chilena"
Hmm Not many sellers in Chile i guess? How about the other countries around? Peru? Do you have Jubaea´s for sale? Maybe there is a reason why people are poor in these countries?? -i dont know what you want say about "poor countries", are you visited these countries??? Hello Christian 1, in PLAMENMANN.DE there are trees of jubaea, big sized trees and small sized trees, the big is very expensive and it cost 23.000 euros. Before you plant a jubaea in your garden you must know the temperatures in Sweden because it can die below - 13 or -15 C degrees. I recommend to plant a medium- small sized tree, bye! What is the size do you want?